From the heartland of Australia’s leisure and pampering universe on the Gold Coast, Annabel Trends is a family run company that’s cornered the market on fresh, fashionable items for the home and for you. 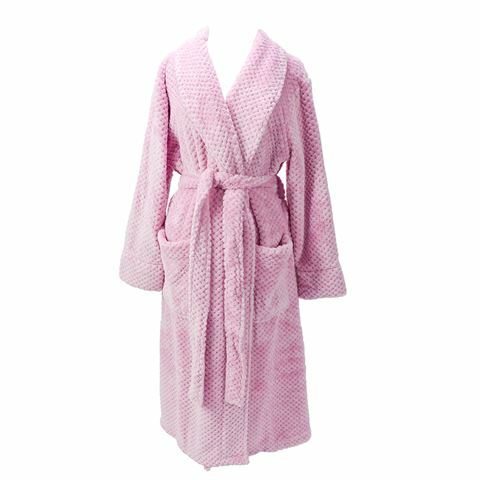 Wrap yourself in some of that traditional Queensland warmth with this glorious super soft pink waffle bathrobe. It will caress your skin whether you’ve just taken a shower or you’re pottering around your home first thing in the morning. In fact it will feel so good to wear, you’ll be reluctant to take it off at all. Feel like a princess in an Annabel Trends bathrobe. Super soft, fashionable waffle texture. Includes a fabric waist tie.